Some of my very favorite memories of being a child involve chasing fireflies. I think their sparkly lights make the night seem less scary and give it a magical quality that nothing else seems to quite match. Hot Summer nights just wouldn't be the same without them. 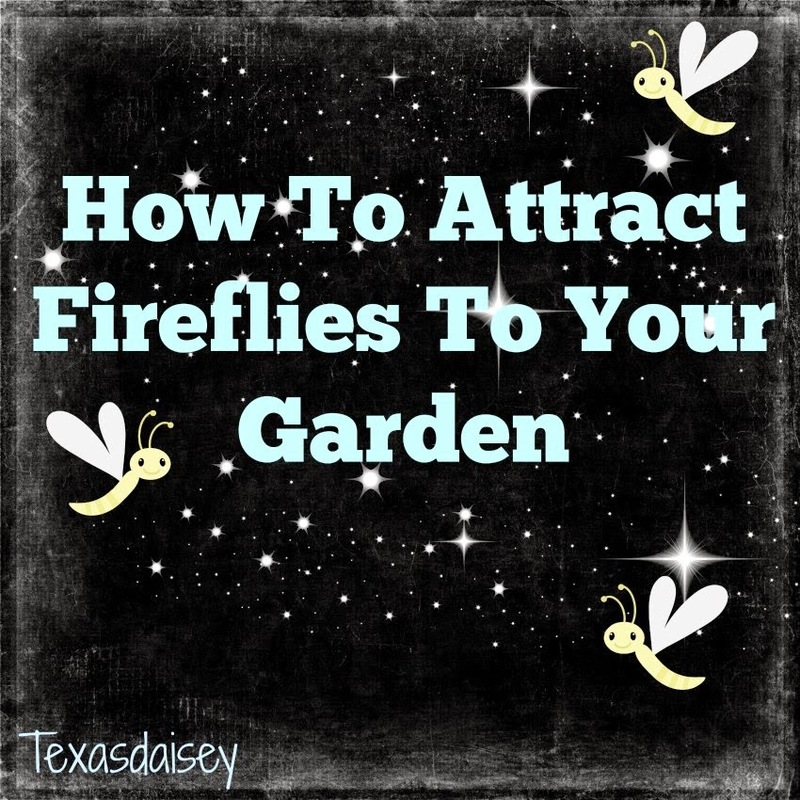 Attracting them to your yard is possible and I would love to show you how to do it. Fireflies or lightning bugs as some call them, are becoming more and more scarce. No one is sure why but there are some who blame pesticides, and others blame light pollution and development of cities. I tend to believe it could be the combination of all those. When we moved to our present house and garden, I decided that I wanted lots of fireflies if that was possible. I prayed for them first of all and I did a little research to discover what they like so that I could be certain to offer everything possible and then maybe, I would get the extreme privilege of hosting my very own sparkly firefly jewels of the night. Fireflies like water. They tend to live near ponds, streams, rivers, marshes, lakes or even shallow areas that hold water such as a bog. They prefer a place where there is standing water. They like to lay their eggs in rotting wood or forest litter near the water source. They prefer longer grass so they can hide from predators. It is also important that the fireflies have areas that are not lit by human methods. The lights seem to disrupt them and the more light present, the less the populations of fireflies. Too much human traffic also seems to disrupt them. No pesticides. I know this one is tough sometimes but it is possible. Thankfully, I have been blessed with fireflies, although, I would love to have even more. How fun will it be to show them to my grandchildren? With that goal in mind, I will make an effort to be certain to offer them as many of these things on the above list as possible. I have also studied the pictures of fireflies that I found, to make certain that I can recognize them in the daytime as well as nighttime. They are funny looking creatures but I will be certain to be careful of and with them so as not to accidentally harm any. In my research, I discovered a really great website: Firefly. This website is packed full of photos, facts, and tips for attracting them to your yard. Be sure to check it out! I live in northern Utah and for the very first time in my life I saw a firefly a few years ago. Here in Utah! I was super excited! I only saw 1 and haven't been out to the same location at the same time since either. Maybe this year! Maybe your lighting bugs are just moving to share the light! I miss fireflies. I remember growing up catching them at grandparents house in MI. But never once have i seen them here in SC not in 20yrs. I would LOVE to show some to my children. Any ideas on where I may take them? Joni, they will come back if the right ingredients are offered to them. One of the largest problems that affect them is the uses of pesticides. Pesticides are not choosy in what bugs they kill...they kill the good and bad ones. That is why it is so important that we get more backyards that are pesticide free and that offer they types of things they need for their habitats. This is important as well for birds, butterflies, dragonflies, ladybugs, and even bees. Danielle P I would check into some meadows or forest areas near local lakes, ponds or other such water rich places. I have found that even an area near a creek is a good place to check. They tend to come out on non windy summer evenings. Fireflies sworn once a year in an awesome display in the great smoky mountains. You can go to Elkmont Camping site and see them. Hundreds of people do. They sworn yearly in the beginning weeks of June. Hope your able take the trip with your children. I live in Alabama and get to see them almost all summer. Fireflies also do better in wooded lots with some underbrush left on the ground like leaves and they like the dark. Great information in the comment above! Thank you! I will definitely have to put that spot in the Great Smoky mountains on my bucket list. And I definitely appreciate the added information about leving some of the underbrush in wooded areas to help them along. I have lots of fireflies where I live, thankfully. I live a little off town in the southern Missouri woods. They like one side of my house better. That side is a bit muddy but not swamp like, lots of large bushes with dropping branches. There's tons of them right down the hill at my little littl so gentle water is fine. The other side of my house has a larger creek that moves faster and they don't seem to be around there. There's also lots of wildflowers and some berry bushes in the area they love. If that helps anyone. They come out in force right after a light rain shower.